In We Need to Talk about Kevin (8x01), Sam wears this jacket for the entire episode, except when he is making/eating dinner at Rufus’ cabin, when he is wearing a suit, and when he and Dean are hanging out in the hotel room in Wisconsin before talking to Channing. In A Little Slice of Kevin (8x07), Sam wears this when they head out to meet up with Mrs. Tran and then keeps it on for the rest of the episode. In Citizen Fang (8x09), we see Sam wearing this coat in the flashback to when he meets Don at the bar. In As Time Goes By (8x12), Sam wears this coat when he and Dean run out of the motel room to find Henry trying to steal the Impala. He wears it for the rest of the episode, except, once they know who Henry is, Sam doesn’t wear it inside of motel rooms. In Freaks and Geeks (8x18), Sam wears this coat when he and Dean track down Krissy at the hotel. He keeps it on for the rest of the episode, only appearing without it briefly when he’s hanging out at the house the next day for breakfast and the phone-call with Dean when Victor sends the kids out to kill another vampire. In The Great Escapist (8x21), Sam wears this coat to Colorado. Once they get their hotel room, he takes it off until his ice bath, but then puts it back on in order to lead Dean to Metatron’s room. He wears it for the remainder of the episode. In Devil May Care (9x02), Sam is wearing this coat when he and Dean arrive at the Bunker with Crowley. He takes it off once they get Crowley secured in the dungeon. He wears it again later when he and Dean go to rescue the hunters that Abaddon has captured. He keeps it on until they get home and discover that Kevin has talked to Crowley, but then takes it off again once Dean has talked to Kevin. In Bad Boys (9x07), Sam wears this coat when he and Dean arrive at Sonny’s to investigate the strange deaths. He wears it for the entire episode, except for when he is digging up the grave, sitting at the diner (it is draped over the back of the chair), and researching in Sonny’s office after the lawn mower incident. In First Born (9x11), Sam wears this coat at the very beginning of the episode when he arrives back at the bunker from a supply run. In Blade Runners (9x16), Sam wears this coat when they go to fetch Crowley from his hotel and when they track down Cuthbert Sinclair (Magnus) and find the First Blade. In Alex Annie Alexis Ann (9x19), Sam wears this coat from when he and Dean arrive in Sioux Falls, until they escape the vampire nest after Jody rescues Alex. In Black (10x01), Sam is wearing this jacket when his car breaks down at the side of the road. He keeps it on until the end of the episode. In Reichenbach (10x02), Sam is still wearing this coat as he walks down the road and phones Cas. He changes into a suit after he steals the truck. In The Thing They Carried (10x15), Sam is wearing this coat when they drop Cole off at his friend’s house, and then proceed to follow him to the cabin. He wears it for the rest of the episode. In Dark Dynasty (10x21), Sam wears this coat whenever he is not in a suit or inside the bunker. In The Prisoner (10x22), Sam is still wearing this coat when they have Charlie’s funeral. In Thin Lizzie (11x05), Sam wears this coat when they get to Fall River and investigate the case. He only takes it off briefly when he wears a suit after the second murder. He then switches back to the coat when they try to track down their main suspect. 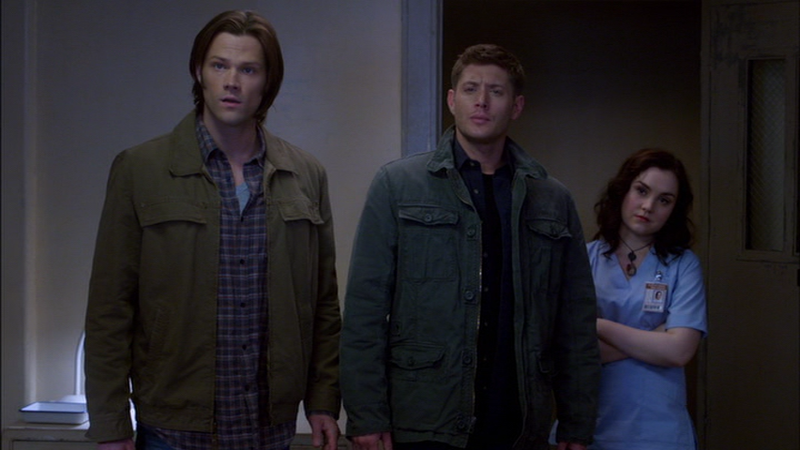 In Red Meat (11x17), Sam wears this coat when they go to check out the cabins until he makes it to the hospital. By Celebrating the Life of Asa Fox (12x06), Sam has gotten the bloodstains out of this jacket and is able to wear it to Asa’s wake. He keeps it on for the rest of the episode. FATE: In Red Meat (11x17), Sam is shot while wearing this jacket. He doesn’t get shot through the jacket, but it still gets fairly bloodstained as a result of Sam bleeding all over the place. 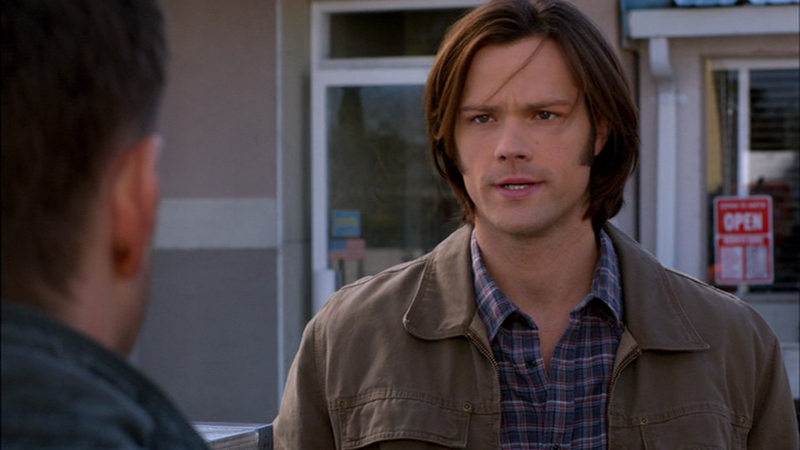 SAM WINCHESTER'S GREENISH BROWN EDDIE BAUER JACKET WITH TWO POCKETS WITH INVISIBLE SNAPS!